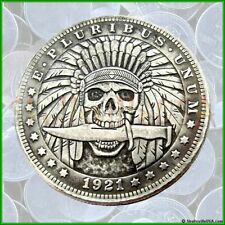 1921 Hobo Morgan Dollar Coin & Free Case - Indian Chief Skull - Rare! Skeleton! (This is a replica and not an original U.S. minted coin). Now with free. Enjoy and appreciate their unique individuality! Skull on Front. Intended for novelty purposes only. Photo is the Front and Back sides of Coin. Not US Currency. Further delays may initiate. 1921 Hobo Morgan Dollar Coin with Free Case - Indian Skull with Knife - Rare! These Rare Hobo Style Coins Are Not Hand Carved. E Pluribus Unum Coin. THESE COINS ARE CUSTOM DIE - COIN MINT STRUCK! "ENJOY Your New Coin". Series "10" . These Coins Are Very Rare - Highly Collectible. Actual coin you will receive is shown. They are not hand carved but are still a great item to have for your collection. Great Souvenir Coins! New Listing1936 Hand Carved Original Hobo Nickel OOAK ~ "Uncle Walter"
~ a satisfied Hobo Nickel Collector. 1936 ~ Genuine Hand Carved Original Hobo Nickel ~ One-of-a-kind! "Uncle Walter". CIRCA: 1936. This coin is hand carved nickel by SteveOrino, who is a. "SteveOrino" is carved on the buffalo. Coin holds No US CURRENCY Value and is Sold as a Novelty item only and is NOT Stamped or Defaced US Currency. (This is a replica and not an original U.S. minted coin). Exceptional detail! FREE highly durable and scratch resistant. Enjoy and appreciate their unique individuality! New ListingAuthentic Hand Carved Hobo Morgan Silver Dollar Hobo Nickel Style! Authentic Hand Carved Hobo Morgan Silver Dollar Hobo Nickel Style!. Genuine and authentic! Carved by me by hand. Clear capsule shown in pictures is included. Shipped with USPS First Class Package. 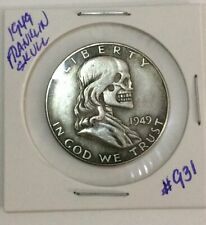 New ListingAuthentic Hand Carved Hobo Nickel Hobo Morgan Silver Dollar Skull!!! Authentic Hand Carved "Hobo Nickel" Hobo Morgan Dollar Skull!!!. Carved on a genuine and authentic Morgan Silver Dollar! Beautifully carved. Amazing detail! Skull in Hat. 1st time I have ever carved the hat part on a Morgan. Came out beautifully. Must have for any collector. Comes with clear plastic capsule shown in pics. Shipped with USPS First Class Package. 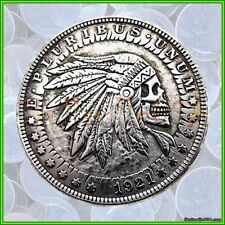 New ListingFully Hand Carved Hobo Morgan Silver Dollar Hobo Nickel Style Skull!!! Fully Hand Carved Hobo Morgan Silver Dollar Hobo Nickel Style Skull!!!. Full stone style background. All hand carved by me. 7 hours of work in to completing this piece. 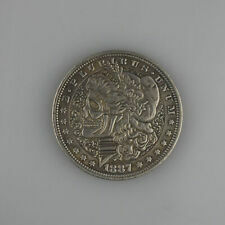 Genuine and authentic 1921 Morgan Silver Dollar host coin! Clear capsule shown in pictures is included. Shipped with USPS First Class Package. These Rare Hobo Style Coins Are Not Hand Carved. E Pluribus Unum Coin. THESE COINS ARE CUSTOM DIE - COIN MINT STRUCK! "RED EYE Series". "ENJOY Your New Coin". Series "8" . These Coins Are Very Rare - Highly Collectible. hand engraved coin. Shipped Free with USPS First Class Package. Hand carved coin by J.W. Hobo nickel style coin engraving. PayPal only Thank you for looking. These Rare Hobo Style Coins Are Not Hand Carved. "SKULL" Series. THEY ARE CUSTOM DIE - COIN MINT STRUCK! "ENJOY Your New Coin". "Series 15" . - Do NOT Miss Out On Owning One Of These Rare Coins -. These Rare Hobo Style Coins Are Not Hand Carved. E Pluribus Unum Coin. THESE COINS ARE CUSTOM DIE - COIN MINT STRUCK! "ENJOY Your New Coin". Most Popular . Series "7" . These Coins Are Very Rare - Highly Collectible. I've now been carving hobo nickels for a couple years and have found that I love the art form. I hope you enjoy my art. Sow kindness and reap a better world. Hand carved Hobo Nickel Skull, Carved in the Original Style. Hand carved by Life Member of the Original Hobo Nickel Society Matt Petitdemange. This coin is Original art, handmade by myself. All my work is initialed and numbered. A truly unique piece of art. I've now been carving hobo nickels for a couple years and have found that I love the art form. I hope you enjoy my art. 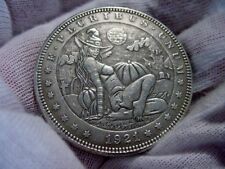 1936 Hand Carved Original Hobo Nickel OOAK ~ "Uncle Jeb"
"Uncle Jeb". ~ a satisfied Hobo Nickel Collector. 1936 ~ Genuine Hand Carved Original Hobo Nickel ~ One-of-a-kind! CIRCA: 1936. This coin is hand carved nickel by SteveOrino, who is a. "SteveOrino" is carved on the buffalo. 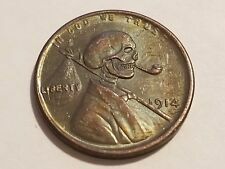 1909 US Cent - Hobo Skull - Novelty Coin. Skull on Front. Intended for novelty purposes only. Photo is the Front and Back sides of Coin. Not US Currency. Further delays may initiate. Total Of 2 Hobo Buffalo Nickels 1937 & 1928. The 1928 came from Silvertowne and has a little history. Shipped with USPS First Class Package. This Hobo Nickel was carved by hand and is 100% authentic. Hobo Moniker: NWO. The engraved coin in the photos is the exact Hand carved coin you will receive. A fantasy coin no doubt, in the Hobo Nickel style. Soon after I went looking for more or others. Not to much longer, I began collecting just as the retiree did. Its a hobby now of sorts. I started with a shoe box of coins from an estate sale and evolved to searching for more of the strange and unusual. Color: As picture show. pealse be aware of this before placing your order. Size: 38mm. Hand Carved Hobo Nickel Fighter Pilot Skull! 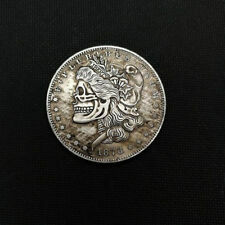 Classic Hand Carved Hobo Nickel Skull! NICE! Original Classic - Pre-1940 Hobo Nickel on 1913 Type 2 Buffalo Nickel. Artist is unknown. Item as pictured. We do combine shipping. Good luck and happy bidding!!! This is a Replica Coin.Ideal for coin collector. Don't buy as Original Coin. (This is a replica and not an original U.S. minted coin). Exceptional detail! Now with free. Enjoy and appreciate their unique individuality! Authentic Hand Carved Hobo Morgan Silver Dollar Hobo Nickel Style! Authentic Hand Carved Hobo Nickel Hobo Morgan Silver Dollar Skull!!! Fully Hand Carved Hobo Morgan Silver Dollar Hobo Nickel Style Skull!! !